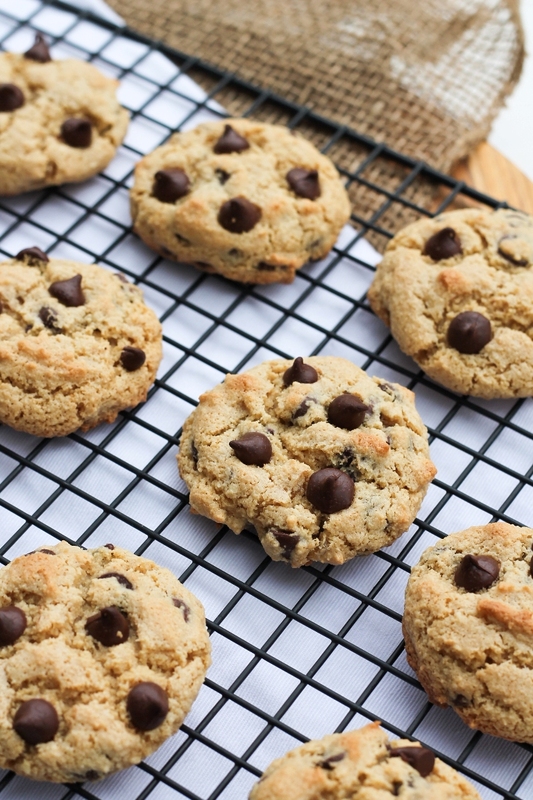 Successfully saved Crispy Vegan Chocolate Chip Cookies to your Calendar. You can also save the ingredients to your Grocery List. These Crispy Vegan Chocolate Chip Cookies are JUST 6 ingredients, made in 1 BOWL, crispy, chewy and buttery thanks to using almond flour and tapioca. The perfect cookie texture. Just 6 ingredients and also gluten-free and oil-free! Please note, this whole recipe is made with mostly almond flour, there is not a sub for almond flour that will produce the same results. When measuring almond flour, a scale is always best for accurate results in baking. Otherwise, be sure to scoop out the almond flour with your measuring cup and gently pat it down and then level off. Store-bought blanched almond flour is recommended here because they produce a softer/fluffier cookie as seen in the photos. Homemade almond meal will make them very flat. 1 1/2 cups blanched almond flour (168 g, I do not recommend Bob's almond flour, as it always produces flat/gritty results. I recommend Kroger Simple Truth Brand or King Arthur or HEB brand if in Texas) 1/4 cup tapioca starch (30 g) 1 teaspoon baking powder 1/4 teaspoon fine sea salt 1/2 cup (160g) pure maple syrup 2 teaspoons vanilla extract (2 tsp provides a strong vanilla flavor, use 1 if prefer a milder flavor) 1/2 cup dairy-free chocolate chips Please note, this whole recipe is made with mostly almond flour, there is not a sub for almond flour that will produce the same results. When measuring almond flour, a scale is always best for accurate results in baking. Otherwise, be sure to scoop out the almond flour with your measuring cup and gently pat it down and then level off. Store-bought blanched almond flour is recommended here because they produce a softer/fluffier cookie as seen in the photos. Homemade almond meal will make them very flat.